Combine water and yeast in a large bowl. Whisk until dissolved, and set aside. Combine milk, butter, sugar, honey, and salt in another glass or plastic bowl. Set aside in a warm spot until butter is melted. Add the flour to the bowl containing the water and yeast, followed by the milk mixture. Stir until a sticky dough forms. Turn dough out onto a well floured work surface. Knead dough for about 6 minutes, adding enough flour, as needed to keep the dough from sticking to the surface, or your hands. Punch down the dough, and turn it out onto a lightly floured surface. Shape into a square and cut into 12-16 equal-sized sections. Roll each piece into a ball and place into the camp oven. Dust the top of each roll with a little flour. This is optional, but gives that classic dinner roll look. Set the pan in a warm spot and allow to rise for 40 minutes. 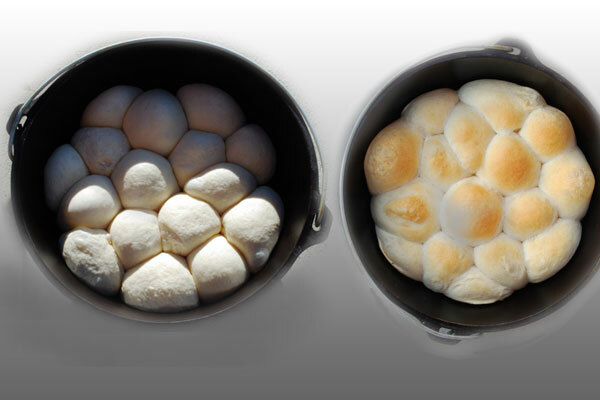 The rolls can be slightly touching each other after they’ve risen. Cook on a bed of coals (with coals also on top) for approx 25 minutes. Remove and let cool on a rack for 20 minutes before serving.